The term “equine asthma” has been given the thumbs up by a team of scientists after reviewing a raft of evidence. They propose that the term mild/moderate equine asthma replace inflammatory airway disease (IAD) and severe equine asthma replace recurrent airway obstruction (RAO) in scientific literature from this point on. Stephanie Bond and her colleagues noted that many terms have been used to describe chronic inflammatory lower airway disease in horses. These include heaves, RAO, equine chronic obstructive pulmonary disease, inflammatory airway disease (IAD), tracheal IAD, bronchial IAD, small airway disease, chronic bronchitis, summer pasture‐associated chronic obstructive pulmonary disease, summer pasture‐associated obstructive pulmonary disease, summer pasture‐associated obstructive airway disease, summer heaves, and summer RAO. They said a growing awareness of various clinical and pathological features of lower airway disease in horses led to the evolution of the various terms. “However, this has become unsustainable, resulting in confusion within both the veterinary and lay communities,” the review team noted in the Journal of Veterinary International Medicine. However, as highlighted during the 6th World Equine Airway Symposium in 2017, the biological appropriateness of applying the term needed to be considered before its widespread adoption in veterinary writing, given its current use in human medicine. A clear and obvious benefit of the change would be increasing comprehensibility among the horse‐owning public and the veterinary profession. However, the validity and limitations of the proposed change had to be considered and described. Before the proposed use of “equine asthma”, RAO/Heaves, and IAD had been widely used and accepted because of their accurate descriptions of the disease processes involved. However, they may not necessarily be two separate conditions. It was, they said, possible that RAO was simply a more severe form. The review team cited 118 papers in their review, during which, among other things, they compared and contrasted features of equine asthma with the most common human asthma forms. There was, they found, the need to preserve the spectrum of diseases which fall within the proposed new “equine asthma” classification. 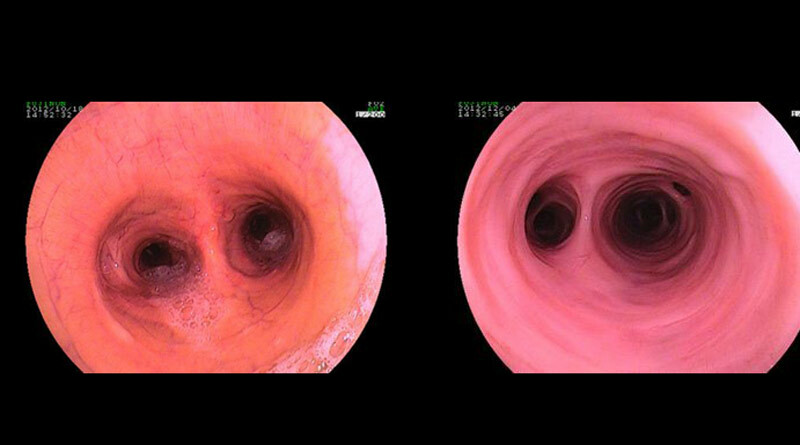 At left, an endoscope picture of the bronchi of a horse with asthma. Note how due to bronchoconstriction the diameter of the bronchi is narrower in this image compared to the image at right, the bronchi of a horse without asthma. Further research is also required to better determine the potential clinical usefulness of phenotype classification. The full review team comprised Stephanie Bond and Renaud Léguillette, Eric Richard,Laurent Couetil, Jean‐Pierre Lavoie, James Martin and Scott Pirie, from a range of institutions.